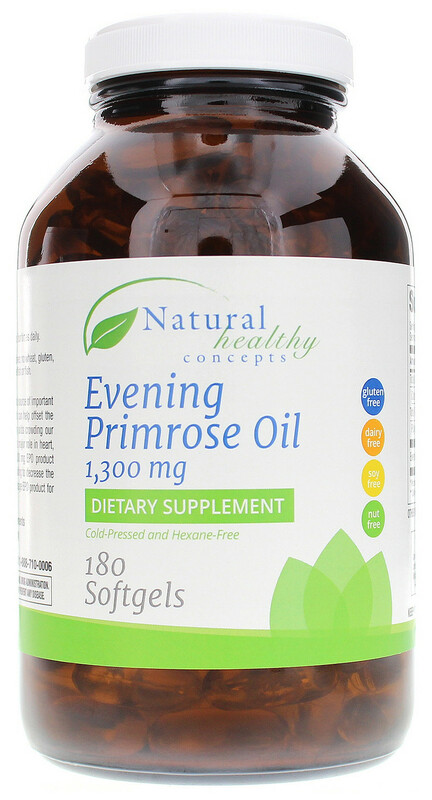 Get Health Support from Evening Primrose Oil 1300 Mg. Evening Primrose Oil from Natural Healthy Concepts is a unique oral supplement for skin care support from a natural, plant-based source of important omega-6 essential fatty acids. The supplement also seeks to provide support for heart, joint, nerve and optimal overall health. A healthy diet contains a balance of omega-3 and omega-6 fatty acids. The Gamma-Linolenic Acid (GLA) in this formula is an omega-6 fatty acid found in evening primrose oil. The body converts linoleic acid to GLA. This formula also includes extra linoleic acid, a polyunsaturated omega-6 fatty† acid, to support metabolism, a healthy immune response and heart health. In addition, the supplement also delivers oleic acid, a monounsaturated omega-9 fatty acid that helps the body’s natural ability to regulate weight, blood pressure levels already in the normal range and cell health. Evening Primrose Oil 1300 Mg Product Details. Plant-based, cold-pressed formula. Good source of omega 6 essential fatty acids. Promotes healthy looking skin. Supports heart, joint, nerve and overall health. Natural Healthy Concepts’ unique brand of nutritional supplements include quality professional products that are hypoallergenic, gluten free, dairy free, soy free and nut free. It’s never too late to get started on supporting your nutrition! Try Evening Primrose Oil 1300 Mg for your health today! Dose Range 3-4 times Daily. Other Ingredients Other Ingredients: capsule (gelatin), glycerin. Typical Fatty Acid Composition per Serving:Gamma-Linolenic Acid (GLA) 130mg. Linoleic Acid 960mg.Oleic Acid 93mg. Serving Directions Adults:† Take 1 softgel with food up to four times daily.